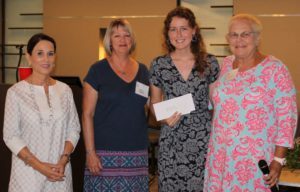 Each academic year, the Sarasota Orchid Society awards scholarships of $1,000.00 to one or more high school seniors or college students from Sarasota or Manatee County with a declared major in the study of horticulture, botany, environmental science, landscape design or other natural science subjects. The scholarship is for a one year period. Scholarship recipients attending college may reapply annually for a period of three additional years, if they continue to meet the criteria for the award. Scholarship money is released upon verification of the applicant’s status as a full time student ( at least 12 credit hours) and at least a 3.0 GPA. Have been a resident of Florida for at least one year preceding the academic year for which application is made. Be enrolled in a Sarasota or Manatee County High School as a full time student or enrolled as a college student with legal residence in Sarasota or Manatee. Declare a major in the natural science fields of study listed above. Submit 2 letters of recommendation; one from a staff member of the applicant’s current school and one from a person unrelated to the applicant. Submit a resume of extra-curricular activities, honors, leadership, job experience, and non-school activities and community service. Submit a statement explaining your interest in earning a degree in a natural science field. Submit a transcript with an 3.0 unweighted Grade Point Average or more, including SAT and/or ACT scores. L to R: Marta Hudson, Barbara Delgato, Jordan Olson and Patty Turffs. 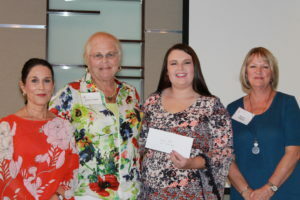 Jordan Olson, awarded a $1000 scholarship in 2017 from the SOS, completed her first semester at St. Petersburg College with a GPA of 3.5 then transferred to State College of Florida. She will continue at State College of Florida for the 2018-2019 term then transfer to Auburn University to major in Agricultural Education. Her desire is to teach agriculture to middle school children to mentor them with FFA/4H projects, promote agriculture in her community, and foster a greater passion for horticulture. 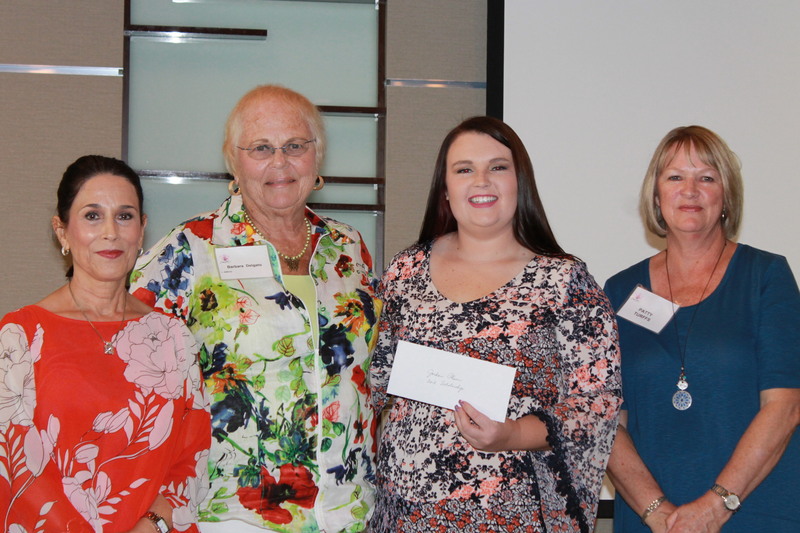 L to R: Marta Hudson, Patty Turffs, Elizabeth Gape and Barbara Delgato. Elizabeth Gape will graduate Braden River High School, Bradenton, Florida with a GPA of 4.25. She is a Key Club member, V.P of the Senior Advisory Board, National Honor Society member, and Environmental Club member. At a young age, she knew she wanted to dedicate a portion of her life to educating young people. Her intention is to become a high school science teacher who hopes to inspire her students to understand local ecosystems, climate change, and the impact of humans on the environment. Elizabeth will attend Florida State University in the fall. She plans to major in Environmental Sciences. 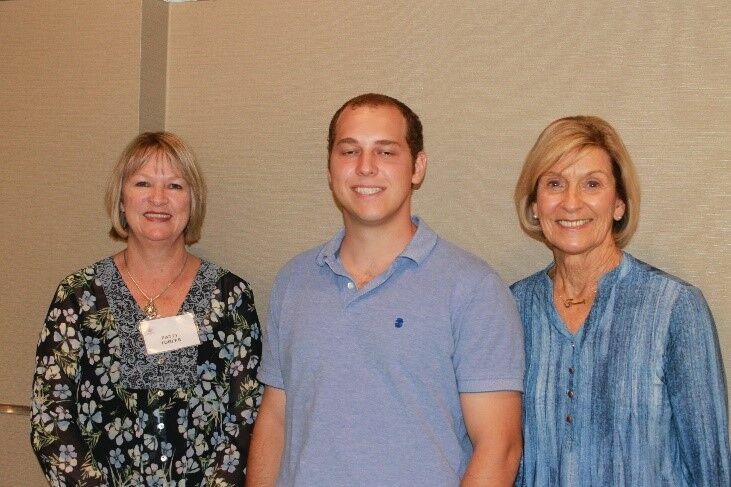 Michael Jungels has completed 2 years in botanical science at the State College of Florida with a GPA of 3.75. He firmly believes that we should be growing floor to ceiling rather than fence-to-fence and that hydroponic gardening is the best solution for sustainable farming, to not only maximize yield, but also consume far less space, water, while using far less fertilizer and pesticides. His goal is to pursue an education in botanical sciences and agronomy, with an emphasis on the symbiotic relationship between mycelial fungi and plant roots in order to understand how to restore the damage caused by deforestation and the territorial expansion of humans. Michael will attend Santa Fe Community College in the fall then transfer to the University of Florida Institute of Food and Agricultural Science. 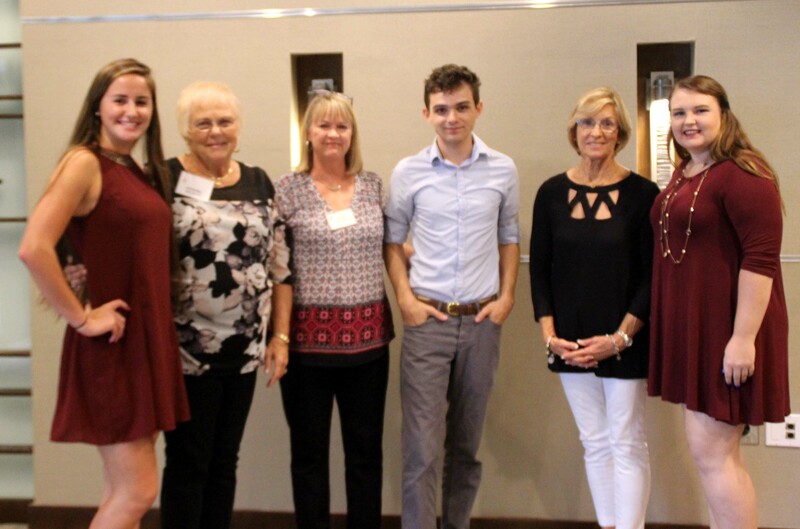 L to R: Carly Fronckowiak, Venice High, Barbara Delgato and Patty Turffs of Scholarship Committee, Brady Schwabach, Booker High, Betty Smith of Scholarship Committee, and Jordan Olson, Palmetto High. Joy Jacobs, Venice High was absent. Students received $1,000 scholarships from the Sarasota Orchid Society to pursue their undergraduate studies in environmental or natural sciences. Joy is a graduate of Venice High School who plans to attend Florida Keys Community College (FKCC) to study Marine Environmental Technology then continue for her Bachelor’s Degree in Aquaculture and Fisheries, to become “The Aquaculture Girl” of Florida raising locally produced seafood. FKCC’s involvement in coral research and restoration projects fits Joy’s passion for marine science which she developed while fishing in the Gulf of Mexico and studying its ecosystems. She participated in youth service projects for the Epiphany Cathedral Life Teen Youth Group, and the Marine Corps Junior Reserve Officer Training Corps Program (MCJROTC) at Venice High. She achieved the rank of Staff Sergeant with the MCJROTC Program and received several leadership awards. She was a volunteer during the summer of 2016 at Mote Marine Laboratories. Brady is a graduate of Booker High School who plans to study environmental engineering at the University of Florida. 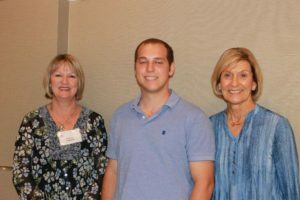 Brady participated in multiple service projects through the College for Every Student (CFES) program at Booker, and is the leader of Booker’s Men of Distinction club. His interest in environmental studies stems from his lifelong passion for fishing in Sarasota Bay, and has led him to pursue conservation efforts in Sarasota, such as petitioning against the dredging projects in the Bayshore neighborhood, and the development of Long Bar Pointe. He plans to return to southwest Florida after completing his education to develop and improve public infrastructure, and preserve this region as an enclave for biological diversity while simultaneously promoting its economic and social growth. Jordan is a graduate of Palmetto High School who plans to attend St. Petersburg College for two years and then transfer to Auburn University to major in Agriscience Education and Communication. Jordan is a member of the AVID program, National Honor Society, Myakka All Stock 4H club, and Palmetto High FFA. Within the Palmetto High FFA, she is the vice president, rabbit show team coach, and committee chair for the Easter Seals Parents Night Out program. She has provided community service through her FFA club in landscaping the Palmetto Historical Park and Rocky Bluff Library, participated in Agriculture Literacy Day, and in Hunsader’s Pumpkin Festival. is a graduate of Venice High School who plans to attend Texas A&M University to major in Agricultural Systems Management. Carly’s volunteer work includes mission trips through St. Mark’s Episcopal Church, working with Heifer International in Rutland, Massachusetts, fundraising to purchase a water tank for a school for underprivileged children in the Dominican Republic, gleaning cornfields through AT Buzby Farms in Pilesgrove, New Jersey, beautification projects at Smokey Mountains National Park in Townsend, Tennessee, and the Navajo Indian Reservation in New Mexico. She is an officer of National Honor Society, president of the Fellowship of Christian Athletes Club, and served as president, vice-president, reporter, and historian in her 4-H club, and as the secretary of the 4-H Sarasota County Council. Rachael is a graduate of Pine View School for the Gifted who plans to major in Geoscience at the University of Missouri in Columbia, MO. RAchel’s volunteer service includes working with children as a camp counselor at St. Martha’s Church, tutoring preschoolers at the Brickhouse Academy, and as an education intern at Marie Selby Botanical Garden managing the Children’s Rainforest Garden and Kids Corner as well as Little Sprouts events. Elizabeth is a National Honors Society Member and a graduate of Sarasota High School who plans to major in Conservation and Environmental Science at either Florida State University or the University of Central Florida. She is a member of La Sertoa Community Service Club, as well as a volunteer at Colonial Oaks Park for the Relay for Life, the Miracle League, the animal shelter, and as a summer camp counselor. As a Selby Gardens’ intern and graduate student, Heather far exceeded our qualifications.We wish her continued success in her research in symbiotic orchid propagation of the endangered Oncidium ensatum in the Everglades National Park.